The ‘Applied Knowledge Test’ is a summative examination that assesses the knowledge required for independent general practice in the United Kingdom. Along with the CSA and WPBA, it forms part of the MRCGP. It uses multiple choice questions because it focuses on application of knowledge rather than just basic recall of facts. 80% of the questions are based on clinical medicine, 10% on health informatics and administrative issues and 10% on evidence-based medicine and critical appraisal. The AKT is held at Pearson Vue (Driving Test) centres. It is a 3 hour 10 minute computerised machine marked test consisting of 200 questions. That’s about 57 seconds per question! The exam can be taken around October, January or April from the ST2 year onwards. The pass mark does vary on difficulty of each exam but historically tends to be in the region of 66-72%. If you have Dyslexia, please tell the RCGP exam office, because they will make sure you get extra time (upto 45 mins, dyslexia links above). A maximum of 4 attempts are allowed and a 5th might be granted in exceptional circumstances. Here’s a website I found if you want a taste of some of the questions (but there are also mock papers in the Downloads section above). Click on the link below to see what a Pearson Vue Centre is like and how the exam is set up. By getting to know what it is like in advance should lessen your anxieties. Click the video on the right to see what you can expect at a Pearson Vue Centre when you arrive. When should I take the AKT? When should I start revising? For starters, you are not allowed to take it in ST1.Therefore you can only take it in ST2 or ST3. I personally think it is better taken at the end of ST2 or the beginning of ST3 – after you have had at least 4-6 months of GP experience. Do not leave it until the second post of ST3 – you have CSA to do and 101 other things and life will become heavily pressurised. Trust me! This is a difficult exam and the amount needed to cover is vast so giving plenty of time to revise is crucial (probably 4- 6 months is recommended). Whether you need 4 or 6 months depends on you and your circumstances. For instance, a full-time working mum probably needs 6 months because you will have a lot on your plate. We have complied the following advice from a number of sources. Of course, we have talked to trainers, TPDs and AKT examiners. But we have also conversed with a number of trainees how have passed the AKT with very high scores. In talking to all these different ‘experts’, we have picked out common pieces of advice agreed by all. Whilst you are reading through this page, if you come across anything which is at variance with what you are doing, please take a moment to pause, breathe, reflect and decide whether you need to make a change or not. Remember, there is always your Trainer, TPD and Educational Supervisor you can talk to (as well as your GP trainee colleagues. Please do talk to a lot of those who have passed the exam, and take their feedback onboard. Examiners are always playing around with the format so read the latest RCGP guidance which you will usually find on their website www.rcgp.org.uk. Then develop a schedule on how you are going to cover all the areas (clinical, organisational etc.) from now until the exam. And stick to that schedule. As you do real consultations with patients, write down any clinical areas you feel you need to brush up on. Either read it there and then, after surgery or schedule it. Attend an AKT preparation course early on – do not leave it til the last minute. The first thing to look at is the AKT Content Guide which is downloadable from the resources link above . The RCGP’s AKT Core Group has developed this learning resource to complement the curriculum which essentially lists the topics that could be tested in the AKT. It is not an exhaustive list and inevitably it will need to be updated but we hope that it will be helpful in defining the topics that candidates should be aware of. Health Informatics & Administration: including administrative, statutory, ethical and regulatory frameworks. Remember, together these are worth 20% of the marks and if you know some of your basic stuff in this area, those questions will be a breeze! That brings us nicely onto the Curriculum Self-Assessment tool available in the downloads section about. Use that to score yourself and identify areas you need to focus on. Remember to be honest with yourself! Occasionally flicking through some online GP magazines (like Pulse and GP Online) can be helpful too. They have a knack of summarising clinical topics very well, often through colourful pictures and flow diagrams. The RCGP AKT webpages has a wealth of information about the exam and how to prepare. Including Examiners’ comments on past AKT papers. This is a great little book packed with great summaries. The first 6 chapters on the ‘organisational’ and ‘administrative’ aspects of general practice are particularly good and cover most things in the AKT exam. See the downloads link above for a summary of the different models out there. A4medicine.co.uk is an amazing resource. It is truly wonderful and we at Bradford VTS love it. A totally free resource that summarises clinical knowledge in a simple A4 sized colourful flowchart with wonderful graphics. Use NICE’s CKS (Clinical Knowledge Summaries) throughout your consultations. Keep referring to it and do it lots in ALL your surgeries. Sooner or later, that knowledge will sink into your brain and it will reside there, ready for the AKT exam! (For those who find CKS too overwhelming, you can consider GP Notebook too – but you have to register through Univadis, which is a tad annoying). eGuidelines is a quarterly publication that gives a visual yet comprehensive summary of all the different guidelines out there. And it’s free. Their strapline is “summarising clinical guidelines for primary care”. The first few chapters of the BNF are rich sources of information. Read through the BNF sections on prescribing, poisoning, prescribing in the elderly and palliative care prescribing. MIMS (by Hays Publishing) also provides extensive clinical summaries – sometimes better than the BNF! For example, I remember one trainee saying to me that MIMS had a section on the newer contraceptives on the market, and this came up in the exam. RCGPLearning has a wonderful set of clinical and non-clinical e-modules for you to take. They are concise and help contextualise each topic area specifically to General Practice. The Essential Knowledge Updates are great and they often give you questions that are similar to what you get in the AKT. Look at the past 10 AKT paper summaries and read the Examiners’ comments. Click here for the AKT Examiner’s Feedback Reports. This will help you identify a number of topics where people had score low and are likely to come up again. In addition, you will also identify a number of topics that you might not have thought about and hence missed in your revision. Please consider buying these books from our Bradford VTS’s bookstore. Amazon give us 4%, although not huge, it helps keep this website free. The eGuidelines app is great for clinical stuff. BMJ OnExamination YouTube channel – under ‘videos’ has short revision videos as well as some great AKT specific stuff. Aman Arora YouTube channel – click on playlists and you’ll see some good short sharp revision aids and AKT specific vids. Aman is a great educator. It is probably worth using a few different question banks to allow sight of different writing styles. There are lots of AKT exam books and online test papers – do them to see how well you are doing. RCGP Home GP Self Test: a great resource for the AKT. Lots of questions. The one I would particularly like to mention is the FourteenFish “pass the AKT package”. You get personalised feedback on your performance. It’s quite amazing. For the books, please consider buying these books from our Bradford VTS’s bookstore. Amazon give us around 4% of sales, although not a huge amount, helps keep this website free. Remember, targeted study at areas you are weak at is far better than a scattergun approach. Reading a book from front to end is also no where near as effective as targeted study. Do lots and lots of MCQs. Yes – go through as many books and online mcq’s as you can. And especially go for resources that provide a good level of detail in their answers for each question. Try and do the practice MCQs (both online and books) at a desk rather than on your sofa. The desk will help improve your focus and concentration. It also helps to keep your ‘place of study’ and your ‘place of rest’ separate (and that in itself will give you some sense of sanity). Know your common areas – Asthma, COPD, CHF, Angina, Hypertension, Diabetes, Renal Failure, DVT pathway, Cellulitis. Read the Examiners feedback on the last 2-3 years of AKT exams. They’re on here in the downloads section about BUT they’re also on the RCGP’s website. They often give you clues about what previous trainees have struggled with. Questions from these areas of difficulty are often repeatedly tested. This is important: if you think about it, the clinical domain is actually limitless BUT critical appraisal, evidence-based medicine, health informatics and organisational topics are more contained. Therefore, don’t neglect these areas as the questions relating to them are pretty easy to pick up. Quite a lot of questions will be based on recent literature. So, get to grips with the evidence for common conditions. Images such as algorithms, ECG traces and photographs may also be shown. Get a good night’s sleep the day before. Read each question very carefully. Look for clues in the wording. Keep checking that you are filling in the lozenges in the right places on the answer sheet. Remember, you have about 57 seconds for each question. Keep an eye on the time otherwise you will run out and then you will risk missing out on answering some potentially easy questions that you do know the answers for. Check the clock every half hour and remember in each half hour block you are aiming to complete 33 questions. (more on this below). A lot of the single best answer questions will have the correct answer but other plausible options. The differentiation will be that for the specific question, one of the options will be the ‘best’ or ‘most likely’. If you can answer the question with the option list covered, you’re likely to be correct. Timing is really important in the AKT. A lot of trainees run out of time because they were thinking too long and too hard about several other questions. The problem with this is that in spending that extra time on these difficult questions, you will run out of time and wont finish the exam. And the remaining questions that you missed might have been lots easier than the ones you were spending extra time struggling on. Hence you lose easy marks, and then you risk failing! You should aim to complete 33 questions every half hour. So checek the clock every half an hour and see how you are doing. Half hour = 33 questions. 2 hours – 132 questions. 2.5h = 165 questions. 3h = 198 questions. last 10 minutes = 2 questions left which should take 2 minutes leaving 8 minutes spare. So, don’t look at the clock every 5 minutes. Just every half an hour. And speed up if you are not getting through 33 questions in that time. The exam itself is not negatively marked so if unsure of a question, after 50 seconds, have a guess and move on. Or alternatively, Questions can be flagged for later review – but move on in a timely way. In planning how best to help you, I have tried to guess your ideas, concerns and expectations for this article and I hope I’ve got it wrong, because my guess is that you probably think that revision is the best way to pass an exam and that what you really need now is a short reading list. This idea is based on the assumption that the best way to pass an exam is to go on the right course, read the right books and practice lots of MCQ questions. But that’s not going to be my advice to you, because that’s not how I see the exam and not how I would recommend you should study. So, if the very idea of applying ideas, concerns and expectations to the AKT is already making you uncomfortable – why is that? Well, firstly, don’t worry – I’m not going to completely overturn your expectations. I would however strongly advise you to reflect on an alternative view of this exam, which is based on the idea that the AKT is an exam designed to test the working knowledge of a competent GP, the concern that what you cram today stays in your brain for a couple of weeks at most and the expectation that if I can persuade you to consider lifelong learning, it really will set you up for life! Although I have only the accounts of others to tell me how today’s GP trainees study, I do have 13 years of experience of examining for the old MRCGP and was briefly involved in writing AKT questions. I therefore know a lot about how examiners think and have witnessed the process whereby questions are chosen and refined for inclusion in the AKT question bank. I also sat the first ever AKT, when examiners were invited to try out the paper in advance of the candidates, and passed it with a score of 82.5% having done no revision whatsoever. So my advice on studying for the exam is not just a collection of random thoughts. So – what does lifelong learning look like? Well, there are two ways of looking at what you need to know to be a GP. The current favourite is to define a ‘curriculum’ and then structure an exam around that curriculum using a ‘blueprint’ (www.rcgp.org.uk/gp-training-and-exams/gp-curriculum-overview.aspx ). This feels reasonably scientific and the exam is very carefully planned to sample different areas of the curriculum in due proportion. But there is another view of what you need to know for real life general practice, which I suggest provides a much better way of preparing both for the exam and for your future career – i.e. consider that common things are common and, as you already know, after just a few weeks you have seen all of the most common conditions (URTIs, headache, back pain, UTIs, feverish children, hypertension etc. 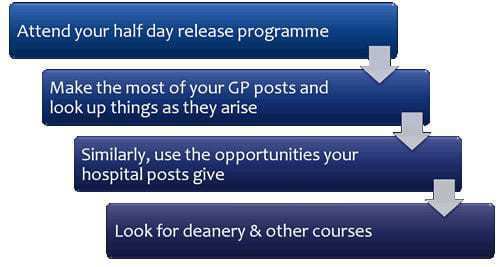 ), after three or four months, you will have seen the majority of important GP problems and after a year you will have seen almost everything you need to know. You may not have seen a case of Churg Strauss syndrome or pseudo-hyperparathyroidism, but that doesn’t matter. You will have seen all the common and reasonably common conditions and refined your ability to recognise what you don’t know and how to find the information you need to manage uncertainty. That is what GPs do and if throughout your trainee years you keep your eyes open and research your gaps and your learning needs (your PUNs and DENs) you will easily cover all that you need to pass the exam. But because you may think it’s better to take the exam early in the year (which I understand, but don’t really recommend), you should also get reading now! Use online resources such as GPnotebook, Patient UK and CKS both during and after your consultations, so that you link your learning to live cases. Make revision notes if you are a note taker and include the patient ID number, so that you can refresh your memory later. Read the BMJ – because it is a reliable source of information and follows the mood of the day, but concentrate on the bits that are relevant to general practice – clinical reviews, the Ten-Minute Consultation articles and papers written by ‘ordinary’ GPs. Read also the assorted bits of paper that come to the practice on a daily basis from various sources. In the past few days, I have seen some useful information on HIV and the Chief Medical Officer’s newsletter which included updates on HPV vaccination, carbon monoxide poisoning and changes to the law on cremation – the sort of information that the AKT question setters are reading but that you won’t find elsewhere! And when you go to meetings in the practice or elsewhere, keep your ears and eyes open for essential information that might make a good AKT question – i.e. information that is relevant to general practice, clear cut and not so detailed or obscure that you would expect to have to look it up. And read a GP magazine (online if you wish to) like Pulse or GP or InnovAIT. InnovAIT is written for you and comes as part of your AiT package. “But what about the cramming?” you ask. Well before you hit the NICE guidelines, first make yourself really familiar with the bible of general practice therapeutics (the BNF) and study the chapter headings for all common conditions. Then register for eGuidelines, which is a good web resource and has a mobile app and only then (if you must) order some NICE guidelines – but be selective. The AKT is not a test of NICE guidance – just ask your trainer when s/he last referred to a NICE guideline during a consultation! By all means know about the guidelines that exist, but focus on when and how to apply them in real life situations. General practice is a very broad subject and quite different to the hospital medicine that you are used to. It does have clear cut content, but there is no definitive study guide, the MCQ books on the market are not written by AKT question setters and the real examiners approach general practice and the AKT from many different angles. Read widely and learn from the patients you see and you will have no problem passing the AKT. First of all, make contact with someone (like your Trainer or TPD) and tell them how you feel. Most trainees who fail feel like they are a complete failure and often feel embarassed at their result. But there is not need to be. Remember, you managed to complete medical school. Therefore you are in the top 1% of this country’s intelligent and educated people. So, don’t feel like a failure. Instead try and see this as part of your journey. Okay, so you failed – let’s learn from that and become a better you. And there is no reason to feel embarassed. We all know that the AKT is a hard exam – and lots of us would fail. Failing the AKT does not mean you are stupid. It simply means that you’re probably not learning in an effective way. Note: I did not say you are not studying hard. Nearly everyone I have come across who has failed always studies very very very hard. But what they don’t do is study in a way that is most effective for them. Instead, they stick to old learning methods like reading a book from cover to cover (and the latest research shows that this method does not make learning stick). Therefore, I suggest you talk with your TPD and trainer and Educational Supervisor. Tell them how you study and ask them if they have any advice on a better and more effective strategy. Do you think you might have dyslexia? If this is something like your third or fourth attempt, consider getting a dyslexia assessment. Dyslexia is a common but unrecognised condition and if you have it, you may be given an extra 45 minutes in the AKT exam. Look at these two websites for more information. Talk to your program director, educational supervisor and/or trainer if you think you might have it. Please don’t feel embarrassed.